For me, creating mandalas is more than just coloring pretty patterns in a circle. I do it because my spiritual evolution and my creativity demand it of me. With each new pattern that catches my eye, I want to play with it, turn it around, twist it, turn it upside down, try it this way and that…and THEN go about coloring it…sometimes more than once. I do this all within an active meditative state, connected with my higher self, my spiritual guides and nature spirits. Together, we bring into form, mandala art the allows me to re-connect with my own inner peace and joy, letting me explore and expand my own creative spirit to however far and in whatever direction I want to take it. As part of my own spiritual journey, I encourage, and hopefully inspire, others to explore their own creativity, to help them re-connect with their own inner peace and joy. 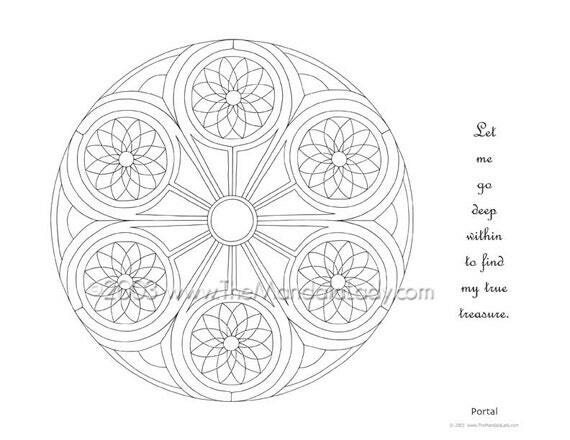 As a means to that end, I make all of my mandalas available for people to color. Why should I have all the fun? I first hand-sketch each mandala using paper and pencil. For the Symmetry and Hyperbolic Tessellation mandalas, I made a guide to put under my paper which allows me to free-hand draw while maintaining symmetry, giving it a more organic look and feel. I scan the drawing into my computer and then trace/draw it into Illustrator. When I’m ready to color or paint it, I print it onto artist quality paper. From there it becomes an exploration into colors and texture. I rarely know in advance the look of the finished mandala. Trusting my guides and intuition as I paint, it grows and evolves into a three-dimensional piece, rich with color; often with the surprise of a whole new pattern emerging. 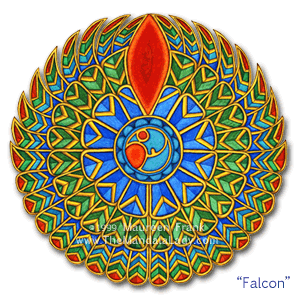 I use a variety of media to paint the mandalas, including acrylics, color pencil, markers and watercolors. I let each mandala guide me as to what media to use.